Greece's Prime Minister Alexis Tsipras goes to the podium to deliver a speech during the Trans- Adriatic Pipeline inauguration ceremony, in the northern Greek city of Thessaloniki, May 17, 2016. The May 17 start of construction on the Trans-Adriatic Pipeline (TAP) marks the beginning of a new phase in increasing diversification of European energy supplies. However, analysts say Europe must do more than merely increase supply to truly establish greater energy independence. The TAP pipeline is a part of the Southern Gas Corridor. Its supporters claim the pipeline will improve European energy security and lessen Europe’s dependence on Russian gas. Detractors, however, say the project is largely symbolic, with little impact on overall European energy supply. At 878 kilometers in length and 1.2 meters in diameter, the pipeline’s highest point will be at 1,800 meters in Albania, and its lowest point will be 820 meters below sea level on the bed of the Adriatic Sea. The $4.5 billion-pipeline will become operational in 2020 and will deliver gas from Azerbaijan’s Shah Deniz II field to southern Italy, transiting Georgia, Turkey, Greece and Albania. With a starting capacity of 10 billion cubic meters (bcm) per year, TAP will satisfy the energy consumption of close to seven million households in Europe. Plans exist to double that amount by adding two compressor stations and expanding gas sources beyond Shah Deniz II into the wider Caspian region. Former U.S. Special Envoy for European Energy Security, Ambassador Richard Morningstar, believes more gas will be available by the mid-2020s. With the prospect of further diversifying European energy sources, the pipeline has strong backing from the European Union. BP, Italy’s SNAM and Azerbaijan’s SOCAR are the three largest investors in the pipeline, each with a 20 percent share. That said, the European Bank for Reconstruction and Development (EBRD) has pledged an unprecedented level of support — serving as the largest lender to the project with about $1.7 billion in credits. In an interview with Reuters, EBRD Managing Director for Energy Riccardo Puliti said the bank will allocate about $550 million of its own money — which would be the largest loan in the history of the EBRD – and will seek to negotiate more than $1.1 billion in credit from other banks. 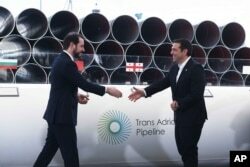 Greece's Prime Minister Alexis Tsipras, right, shake hands with Turkish Minister of Energy Berat Albayrak during the Trans-Adriatic Pipeline inauguration ceremony, in the northern Greek city of Thessaloniki, May 17, 2016. Development of the Southern Gas Corridor seems to be not only an objective for the EU but a concern for Russia. At the time when the Western-backed Nabucco pipeline was being considered, Russia proposed the South Stream Pipeline, which could have taken Russian gas across the Black Sea to Bulgaria. This project failed largely due to incompatibility with EU competition regulations. Russia's Gazprom proposed yet another pipeline — the Turkish Stream — which also failed to evolve into a viable project. Gazprom is now trying to revive the so-called “Poseidon Pipeline” — connecting Turkey, Greece and Italy — which would have a capacity of 8 bcm per year. During his visit to Greece later this month, Russian President Vladimir Putin will most likely push for Greek support for Poseidon. Some experts believe that TAP simply does not have the capacity to lessen Europe’s dependence on Russian gas. In 2015, Gazprom supplied 31 percent of the EU’s gas needs, which is about 158bcm, or 15 times the capacity of TAP. But even a smaller amount can have a significant price effect. While still heavily dependent on it, most West European countries have other alternatives to Russian gas, including Norway and North Africa. But in the Balkans and Italy, TAP would be more than symbolic — it could have a real impact on reducing both economic and political dependence on Russia.